Monday's 19th Annual Bluegrass-Buckeye BYGLive! (BBB) was held at the Buffalo Trace Distillery in Frankfort, KY. Participants enjoyed the pleasant yeasty aromas wafting from the oldest continually operating distillery in the United States as they were treated to research and plant diagnostic updates from University of Kentucky diagnosticians and scientists. Indeed, plant diagnostics and the distilling of spirits converged with observations of a black, sooty-mold-like growth covering plant stems and leaves as well as various structures at the distillery. The fungus responsible for the black, crusty growth is Baudoinia compniacensis. This ascomycete (Phylum Ascomycota) is unique to distilleries as well as commercial bakeries and has a world-wide distribution. It is found around brandy distilleries in France, scotch distilleries in Scotland, whisky distilleries in Ireland, vodka distilleries in Eurasia, and spirit distilleries throughout the U.S. 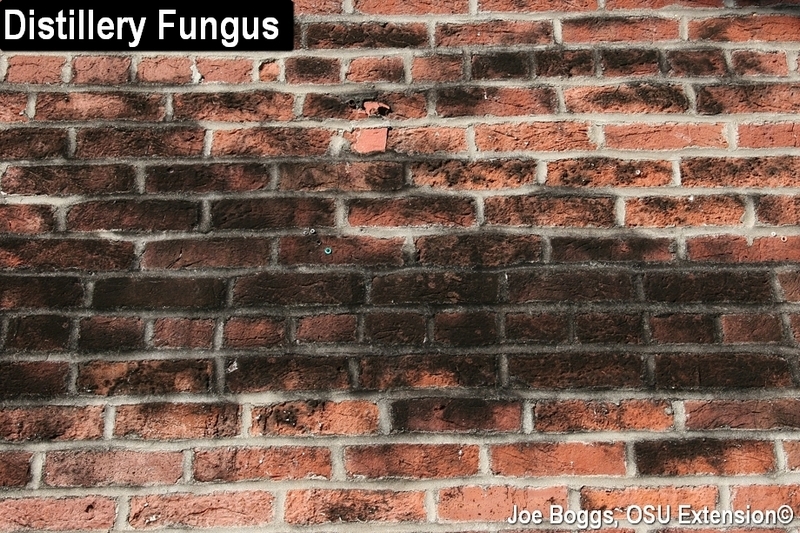 The fungus is referred to by many common names including distillery fungus, distilleries' shadow, whiskey fungus, angels' share fungus, and warehouse staining fungus. The names angels' share and warehouse staining fungus refers to what happens as distilled spirits are aged and the warehouse facilities where the process occurs. For example, bourbon "aging warehouses" hold white oak barrels filled with 53 gallons (at the beginning) of raw distilled "white dog" (e.g. moonshine, white lightning) until the harsh whiskey matures into mellow bourbon. The barrels are not air-tight so some of the whisky is lost during aging, more of it being ethanol than water. This is known as the "angels' share;" a name used world-wide for the loss. On average, the angels' share is around 2% of the volume per year; however, aging warehouses are not air conditioned in the summer, so the loss can be much higher depending on ambient temperatures. In Kentucky, it is common for only around 1/3rd of the original volume to remain in an 18-year-old barrel of matured bourbon whisky. B. compniacensis is unique in that it can use ethanol escaping from spirit aging facilities as a carbon source. The ethanol also plays a role in "pre-conditioning" the fungus to be able to withstand high temperatures as it bakes in the sun on the sides of an aging warehouse or other distillery structures. Research as shown that the fungus is not totally dependent upon ethanol as a food source; it can also make living on other carbon sources. However, its unusual ability to grab ethanol from the air for its own purpose and capacity to thrive in harsh environments makes this an exceptional fungus and explains why it is so closely associated with distilleries as well as occasionally with commercial bakeries. Remember that bread dough rises through fermentation with ethanol being a byproduct of the process (proofing). Based solely on the production of black accretions, it would be easy to assume the distillery fungus is closely related to the "black sooty mold" fungi that make a living on honeydew excreted by various sucking insects. Indeed, most of the sooty mold fungi belong to the same ascomycete class (Dothideomycetes) and order (Capnodiales) as B. compniacensis; however, they belong to different families. So, the relationship between the distillery fungus and black sooty mold fungi is like apples (family Rosaceae) and oranges (family Rutaceae). On an historical note, the distillery fungus was first brought to the attention of scientists by a pharmacist, Antonin Baudoin, in the 1870's. He published several reports regarding a black, soot-like growth on buildings near spirit maturation warehouses in the famous town of Cognac, France. The fungus was officially described by taxonomists in 1881 and named Torula compniacensis. The genus Torula means "little rounded thing" and is based on the microscopic structure of the fungi grouped in this genus. The specific epithet, compniacensis, means "from Cognac." So, the species name translated to "little rounded thing from Cognac." It was a serious name; this was before science fiction B-movies. In 2007, the unique characteristics of the fungus sparked the creation of a new genus; Baudoinia, named in honor of Antonin Baudoin, and the distillery fungus was placed in this genus.